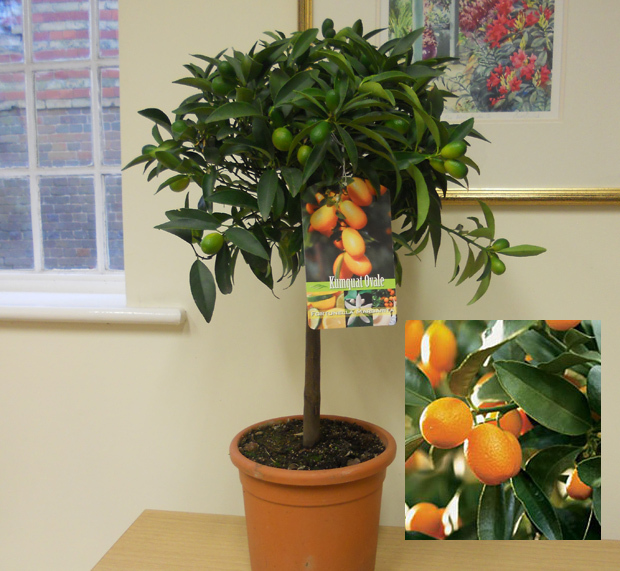 Andy McIndoe's Designer's Diary: Zest for Life: Growing Citrus at home: time to try a kumquat! Zest for Life: Growing Citrus at home: time to try a kumquat! The smell of citrus, cloves and cinnamon somehow captures the whole spirit of the festive season; a Clementine in the toe of your stocking and a bowlful on the dresser. A slice of lemon in the gin and tonic, and the zest of the fruit in your mince pies, Christmas cake and pudding; the joys of christmas. In fact the calamondin orange, with its small clementine-like fruit was quite bitter and dry, but the flavour was intense, especially from the skin. We always recommended them as an addition to drinks or preserves; whether anyone ever used them was a different matter. Today I grow a lemon tree in the conservatory in winter and outside on the patio in summer. At this stage my plant is covered with promising buds, and the small green embryo fruits are swelling. Any day now a few flowers will open, and fill the cool morning air of the conservatory with their sweet fragrance. The scent is spicier than that of the Jasmine, which blooms in the New Year; heavy and delicious. Usually by now there are golden yellow ripe lemons hanging on the plant, unwaxed, full of juice and deliciously aromatic; as different from a shop-bought lemon as frost from fire. So what’s the drawback with growing your own lemons? The plants do go through their unprepossessing stages. They shed a few leaves; occasionally get scale insects on the foliage, which leave behind those black sooty deposits. Usually by late spring the plants look a little tired so its time for the summer holiday outside. I cut them back at this stage too. So what about other citrus? Are they worth growing? One is, and I’ve discovered that it’s the star of the show: The Kumquat. 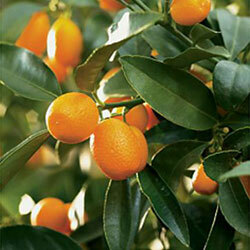 Small, dark green abundant leaves on compact plants, the kumquat is most attractive grown as a short standard. It produces wonderfully fragrant waxy white flowers followed by shining green embryo fruits; these eventually develop into golden-orange drops hanging from the plant. It fruits more freely than other citrus, is more suited to growing on a light, cool windowsill, and is by far the most attractive of all citrus fruits. What’s more the fruits are delicious picked ripe from the plant, in jams and preserves, fruit salads and other deserts. All you have to do with your kumquat is five it a light airy position close to a window, or in a cool greenhouse or conservatory. It is not hardy so will not survive the winter outside, but it does not need heat. An unheated conservatory that is reasonably frost free is ideal. Water your kumquat regularly but do not overwater, allow the compost to almost dry out between waterings. Feed with citrus or tomato fertiliser from spring through to autumn, and by all means stand outside in summer in an open sunny position. Out on the patio in summer the flowers are more likely to be pollinated by bees and other insects than they are indoors. To celebrate your success: Cut a ripe kumquat in half and pop it in the bottom of a cocktail glass. Add a teaspoon of dry vermouth. Top up the glass with your best vodka straight from the freezer. Stir very gently with a cocktail stirrer. Enjoy! After a couple your kumquat will miraculously have more fruit, or at least it will appear so! Peaches on the Patio, nectarines too!